RTE PRIME TIME covered the topic of online sexual predators, exposing the generic locations of potential sexual offenders along with shortcomings in Ireland's cybercrime division. The provocative episode also pointed to a glaring lack of understanding by children's advocacy groups, parents, and government agencies of the technology involved in meeting and grooming potential victims. Blocking young people from clever child molestors is not an easy task because as Prime Time showed, evil can easily skip across the internet and into quiet bedrooms where pre-teens are nurtured and groomed for real world contact. I work with young teens and more than 10 percent of them admit to having met up with an adult stranger in real life after chatting online. According to Common Sense Media, one-third of teens are considering an encounter. If the cross-talk on Twitter is any indication, the RTE telephone operator and producer's email account both received ample feedback about a story that needs further development. This is one area where education should play a leading role in preventing hurt. Common Sense Media rates media used by pre-teens and young students. It offers hands-on ready-made units that might be suitable in Transition Year. Following Derek Baird's Delicious links for more related information. Previously: "Safe Saucy Sexting", September 9, 2009. WE SPENT THE WEEKEND in the Kingdom of Kerry and I could not see the value in reading four Sunday papers when the Dingle peninsula was right outside my window. So I bought the weekend edition of the Financial Times Weekend and shared five minutes of my thoughts through the pink pages while recorded with Qik in the sitting room of Emlagh House in Dingle. There are five main points worth sharing in the FT Weekend . THERE ARE SEVERAL VOICES in Ireland who offer a solid understanding of the social conversation that has emerged around how companies should be doing business today. Social Bits from Limerick and Galway has fingered several of them in a three-part video documentary that deserves to be a set piece on the social networking module in Tipperary Institute. View the video on YouTube or listen to the audio. I'M CONVINCED THERE ARE stories waiting to be told in Parknasilla, the first Victorian structure I knew before moving to Ireland. I don't think any of my Irish forebears had the resources to spend time in Parknasilla before they left County Clare for the States but they certainly had stories to reference the grand place. So I'm fulfilling my destiny by spending the weekend in County Kerry, not knowing what stories I'll find. The last two Americans who visited our place in Cashel spoke glowingly of their Kerry adventures. So did Bill Clinton when he hit the links at Ballybunnion. We'll collect a friend at the Kerry Airport and bed down in Parknasilla for a while. If I lose track of time, there will be no Qik Sunday News this weekend as a result. There are many worthwhile walks, sweeping scenic views and a very inviting swimming pool that will probably interfere with reading the Sunday papers. However, you'll be rewarded with several Qik updates from County Kerry instead. I SAW MY FIRST OLPC a few years ago during Reboot and have to say I like the form factor and cost in the vision of the newest version. The One Laptop Per Child (OLPC) project was scorned for being underpowered and costing double of its initial pricing goals. And the teachers who tried to use it in the field had other issues. Notably, it didn't have a method for non-Latin characters to be input. It was also made of plastic and had moving parts that would often break in rugged environments. 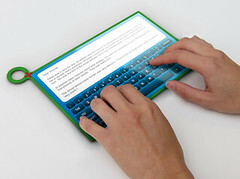 All sorts of character sets are available on the prototyped new device because its keyboard will be virtual and be able to adapt to different languages. This is just like my small Android phone behaves. The new OLPC XO-3 is also specified to have a few features that appeal to me, starting with the camera. It appears the XO-3 has at least one, and maybe two, video cameras. The device comes with Wi-Fi antennas, multi-touch screens and enough power to play HD video. And unlike the iPad, the XO-3 can accept bog-standard plug-and-play (PNP) peripherals such as mice and keyboards. Sure, you can get the iPhone's Touch OS to accept the Apple-vetted keyboard docks and Bluetooth Keyboards, but not at the same price points as the after-market PNP commodity devices. However, all these features are just pre-spec. Lots can go wrong from the vision to the final product. Seth Weintrab -- "One Laptop Per Child is now a $75 Android tablet" in Fortune , 27 May 2010. Marie Boran -- "OLPC Unveils XO3 Concept Tablet PC" in Silicon Republic, 23 December 2009. Bonus Link: Other things I saw during Reboot 9. LIKE SIMON MCGARR, I would like to know who are the principals behind Gateway Ireland and how the newly-launched entity conforms with best practise as laid out by Irish Standards in Public Office (SIPO). I'm impressed by the list of people invited to attend yesterday's launch event but that does not change the need to conform with well-regarded standards of practise. If the organisers of Gateway Ireland fail to meet or exceed SIPO standards, they risk the venture deteriorating into a quango that exists to provide jobs for the boys. I suspect the people behind the vision are watching the public response to the launch of their "national website to promote Ireland by accumulating existing information and resources and amalgamating it at one location." I'm a little uneasy when I cannot find standard disclosure materials while reading soft statements that "the site will be monetised with profits going to charity (and) that the organisation itself will be structure as a charity." Simon McGarr -- "Your Country Your Call, the SIPO Question" from 20 May 2010 on the Tuppenceworth blog. John Mulligan -- "Catch-all website plans to promote nation through electronic embassies" in the Independent, 27 May 2010. LISTEN, FROM GOOGLE LABS, is my Android App of the Week. It downloads and runs for free on my Xperia X10 handset and is smart enough to pull its audio feeds only when connected to a wifi node. Listen has connected me to social audio. I use Listen to automatically cache TWiT, TWiG, FIR, e-learning stuff, IPR, CPB, DSC, Huffduffer, TAL, NYTTT, IHR, and a rising chorus of Audioboos. It is smart enough to rejoin clips where paused. It respects SD card memory so it asks for the number of episodes I wish to keep on the handset. It manages podcasts better than iTunes. I haven't tried to manage audio files harvested by Listen while using SonyEricsson's software but I imagine that's possible with a little diving into the file structure. Listen: my Android App of the Week. 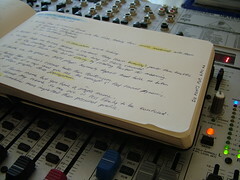 Audioboo -- "Sharing Social Audio" was recorded on the Xperia X10 that SE graciously loaned me for stress testing. Previously -- "Listen on Android", May 12, 2010. GOOD CLEAN-UPS have to extend beyond the rubbish that you toss away. For me, it involves a process that I haven't mastered. So it's back to Getting Things Done and rewarding myself when I stick to a proper routine. The Qik clip shows some office clean-up and I'm sharing it in the hope that my wife does not see what I've done at work because she'll want the same result at home where I've a bomb site for a study. I SPENT A FEW HOURS in Dublin's Googleplex to hear Matt Cutts' take on "How Google Works" and took away four thoughts that I will add to the Web Analytics, Social Media and Media Writing modules at Tipperary Institute where I work as a lecturer. Based on the event's Twitter chatter, I may elevate all four main takeaways to Final Exam status. The Dublin Chamber of Commerce arranged the well-attended event and Matt Cutts did the assembled group a big favour by bringing the warmest day of the year to Dublin during his visit. That personal feat also earned Matt a Dublin sunburn, something many Irish yearn to obtain. An important note on the takeaways listed below the break: some of the commentary is mine, informed by current practise, while others are all Matt Cutts'. You can tell the difference by listening to the pocket audio recording that accompanies this post. If you're subscribed to my blog using Google's handy Listen application, you'll hear the background rumble of the warm weather air conditioning in the meeting venue.